I meant to post something about my thesis defense on last Thursday (May 15th). I’ve got some pictures from it up. I realize everyone else posts pictures to Picasa or Facebook or something like that, but I’m going to be stubborn and stick with my own thing. I’ve still got some revisions to do, but other than that, I am all finished with school (after roughly a quarter of a century in school). I guess I don’t 100% count as a Dr. until after those are in, but I’ll get the revisions done early next week. The past two days I’ve been too busy catching up with things on the TiVo and playing Smash Bros. on the Wii. When the revisions are done and I figure out how to attach the cover page without breaking the rest of the pdf, I’ll put a link to my dissertation up. Mostly because the cover is pretty since I know that with my committee it probably already saw all the readers it ever will. I just watched something like three hours of Battlestar Galactica. The one thing that sticks out the most to me is just how much I hate the fake swear they use. “Frak” is such a stupid word. Curse, bleep, or don’t do anything. But don’t make up stupid sounding fake swears. Nothing makes dialog sound worse. Otherwise this season isn’t bad so far. And I’m almost caught up. 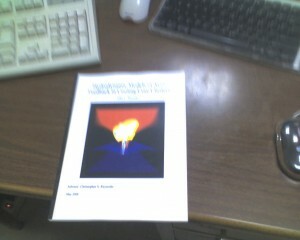 Hard to make out in the picture, but that is a copy of my dissertation, nicely printed and bound at Kinko’s. It looked so good I decided I needed a picture of it. Only took two trips to Kinko’s for them to get it right (and something like $30 per copy), but I’m happy with the results. It is now (as of yesterday actually) with my committee and I have 13 days to prepare for the defense. Preparing talks is kind of fun, so I’m at least not dreading the preparing part (but the defense itself is a slightly different story).